Blue Spruce Lodge - Created in 1935 at Camp Brule in the General Sullivan Council, it replaced the OA lodge there (not unheard of) which was chartered in 1927. It existed from 1935 through 1952 then it was replaced by the OA in 1953. As part of the induction weekend, candidates would carve their name and the words "Blue Spruce" into a rock with a nail. These rocks were placed at the council fire ring with those that came before them. The OA lodge that replaced them continued the tradition except replaced "Blue Spruce" with "WWW" and an arrow. The Blue Spruce Lodge was similar to the OA except not as formal or structured. They reportedly did not have a patch. 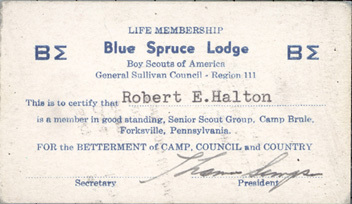 This membership card dates to the early 1950's.